Missouri Loves Company Rally is coming up! September 22-24, in St. Louis Mo and I am going! Have the time off work, have my registration done and a hotel room booked but might be changing that. It looks like some of the Street Urchins from Peoria, Bloomington and Normal might be coming too, I go up there to ride with them now and go south to ride with the groups in St. Louis...seems I am in the middle. Our closing brunch is this am, I am slowly packing up. This is my very first scooter rally and it has been fun, awesome, and I have loved my time down here in St. Louis and meeting so many other scooter people in the flesh, cyber is good, but real time has been a real treasure for me. I will have to see if I can move them from my cell phone, but I didn't slow down long enough to take many photos, my LXV gained 599.7 miles!!! I went down early to shop some and play. 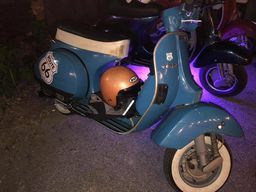 And had fun, found an estate sale, but no way to bring home that 8+foot tall awesome cherrywood bedframe, I have 9.5 high ceilings and a downstairs bedroom that needs some work and a new bed, so sad as price for it was good but there was no way it would fit on the back of my scoot. But the large plastic wheeled food bin did so now I have a container for the next 50# bag of pastry flour. And I won the Lambretta shirt, along with oil, very vintage Lambretta framed ad and pins. Played hard, rode around St. Louis a bit...well, maybe more than a bit. And it was cooking hot!!! High 80's to 90's so we melted unless we were moving.